The All-American flag kit is a residential flagpole kit that features all Made in the USA products. It comes with a 3x5' Nylon American Flag with sewn stripes, embroidered stars and lock stitching. The pole is a two-piece black powder-coated 28 gauge steel pole with a hardwood ball ornament and rotating flag fasteners designed to keep the flag from wrapping. The two-position brackets are made from strong HDPE. 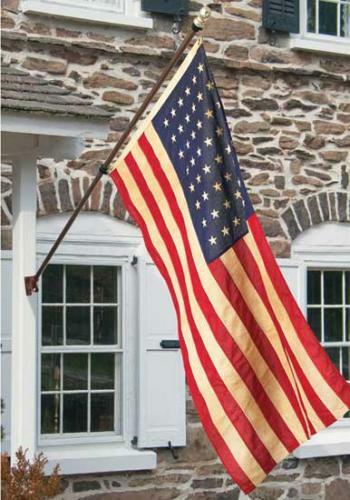 This residential American flag and pole, as well as the bracket and ornament are all manufactured in the USA.